Gee whiz, an "electronic welcoming mat"
Earlier this year, the Lincoln Center for the Performing Arts unveiled a plan (see The City Review article) by Diller Scofidio + Renfro to dramatically alter Pietro Belluschi's fine Brutalist building at Alice Tully Hall, the second best building at the center after Eero Saarinen's Vivian Beaumont Theater. 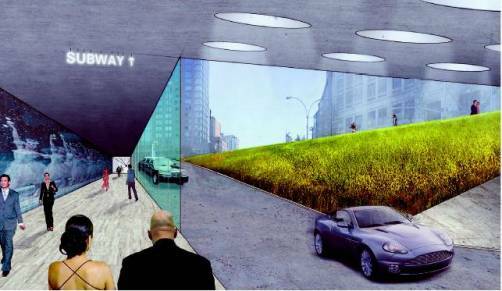 Now, the center has unveiled a second plan by the same architects that would dramatically alter the main frontage of the center by tacking on large canopies to the east facades of Avery Fisher Hall the New York State Theater and burying the roadway drive in a tunnel surrounded by "tall grass." Not only are these plans inane, they are also as outrageously expensive as the controversial memorial at the former site of the World Trade Center. Incredibly, the various component institutions of the center have approved these plans. What type of buffoons are running such important institutions? Have they no shame? No couth? No architectural sensitivity? 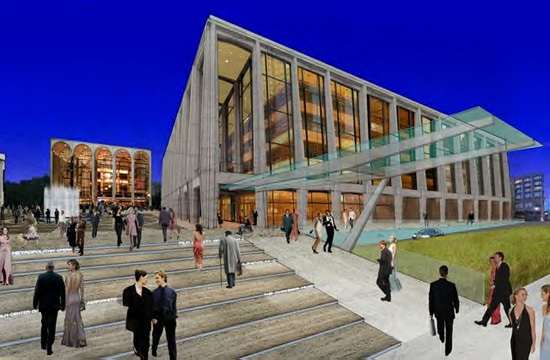 From its start, the center's campus has not garnered critical acclaim, but these two schemes not only do not improve it, they make it worse by destroying the integrity of the original designs for not purpose rather than spending huge amounts of money that certainly could well be used for better purposes, like creating a museum of the performing arts at the center. "Lincoln Center, Inc. has raised $339 million, or 75%, of the $459 million that is its share of the estimated $650 million for the West 65th Street Project, the first redevelopment initiative at Lincoln Center. 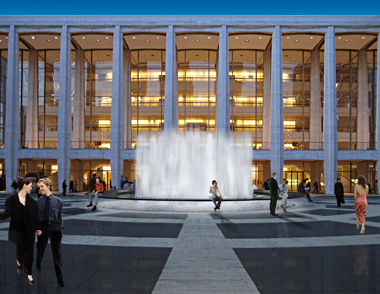 The $459 million includes a $50 million endowment goal for Lincoln Center, Inc. The other organizations participating in the West 65th Street Project have made comparable progress in reaching their collective goal. The constituents who will enjoy a dramatic new street presence on West 65th Street are: The Juilliard School, The Chamber Music Society of Lincoln Center, The Film Society of Lincoln Center, Lincoln Center Theater, and School of American Ballet. These announcements were made today by Frank A. Bennack, Jr., Chairman, Lincoln Center, Inc., at a celebration of redevelopment milestones. "Additionally at this event, dynamic conceptual designs by Diller Scofidio + Renfro, in collaboration with FX Fowle for The Promenade Project, Lincoln Center's second redevelopment initiative, were previewed. 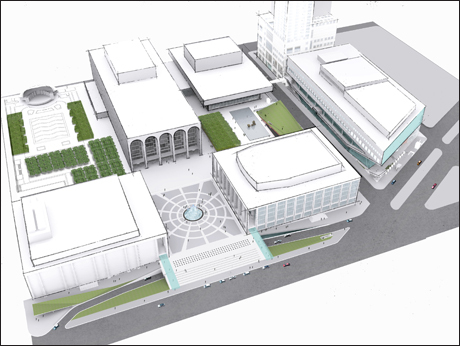 The Promenade Project focuses on Lincoln Center's iconic Josie Robertson Plaza and the campus' primary Columbus Avenue entrance. Separately, Morphosis and Tod Williams Billie Tsien Architects were named as the finalists selected to design Lincoln Center's recently announced Harmony Atrium initiative. In making these announcements, Mr. Bennack was joined by Mayor Michael R. Bloomberg; acclaimed performing artist and Juilliard graduate Audra McDonald; Commissioner of Cultural Affairs Kate D. Levin; Commissioner of Parks and Recreation Adrian Benepe; Congressmen Jerrold Nadler and Anthony Weiner; Katherine Farley, Chairman, Lincoln Center Development Project; and Lincoln Center President, Reynold Levy. "The $339 million represents a broad coalition of public and private funding sources for the revitalized West 65th 'Street of the Arts' including, for the first time since construction on Lincoln Center began in the 1950s, major capital funds secured from all three levels of government: more than $22 million in funding has been authorized through federal agencies; $30 million from New York State pending final budget adoption; and up to $90 million from the City of New York have been secured. Other firsts include the first-ever capital campaign which benefits the entire campus, the first endowment campaign for Lincoln Center, Inc., and the first capital campaign for Lincoln Center's public spaces. "In addition, Lincoln Center has received 20 gifts of $5 million or more, nine of which are at $10 million and above. Along with government support, donors are broadly represented among individuals, corporations, and foundations. "The vibrant inaugural West 65th Street Project, by the innovative architects Diller Scofidio + Renfro in collaboration with FX Fowle, is designed to make Lincoln Center more accessible and open, creating a dynamic 'Street of the Arts' spanning West 65th Street between Broadway and Amsterdam Avenue. The West 65th Street Project began construction earlier this spring and is expected to be completed in time for Lincoln Center's 50th anniversary in 2009. "Now that the lead gift campaign for West 65th Street is close to completion, Lincoln Center will be broadening its approach to individuals, corporations, and foundations throughout the nation. "Diller Scofidio + Renfro, in collaboration with FX Fowle, have created a complementary plan to rebuild Lincoln Center's primary entryway along Columbus Avenue and to upgrade and reenergize the adjacent Josie Robertson Plaza. Drawing upon the same design vocabulary and palette of materials being used in Lincoln Center's inaugural West 65th Street Project - glass, travertine, new landscape features, and integrated information technologies for enhancing the visitor experience -The Promenade Project, unanimously approved by all 12 resident organizations in March, is designed to further unite Lincoln Center with the surrounding cityscape. The plans create a more dramatic and functional threshold to what is Lincoln Center's iconic front door, and open up the campus to encourage the interaction of artists, students, and the public. Construction for the project will be integrated into West 65th Street construction activity. "Diller Scofidio + Renfro's plan separates pedestrian and vehicular traffic for visitors who arrive using the Columbus Avenue service roadway and stairs. Their conceptual design sinks the existing service road below street level, creating a new and generously proportioned concourse-level roadway to serve audience members arriving by car, while at the same time separating pedestrians, making their arrival pleasant, safer, and free from traffic. "The design expands the existing staircase into a new, 171-foot wide travertine marble grand stair that will enable visitors arriving by taxi or private car to disembark curbside from Columbus Avenue and walk directly up the new grand stair onto Josie Robertson Plaza. Twin flanking travertine ramps will give additional access, with sleek glass canopies that project dramatically from Avery Fisher Hall and New York State Theater's arcades providing arriving visitors with protection during inclement weather. "Cars arriving from the north and eastbound cars from 65th Street will be directed under a new canopy, where a three-lane roadway and waiting area will provide access to stairs, escalators, or elevators that will bring patrons up to Josie Robertson Plaza or into newly renovated, clearly defined underground passageways. Dramatic new landscaping will add to the creation of a more inviting entrance to Lincoln Center, incorporated along Columbus Avenue between 62nd and 65th Street. The extension of 21st-century interactive information sites for visitor services and the use of a consistent graphics system throughout the campus are essential parts of the plan to identify and unify the different parts of the campus and mark the four corners of Lincoln Center. 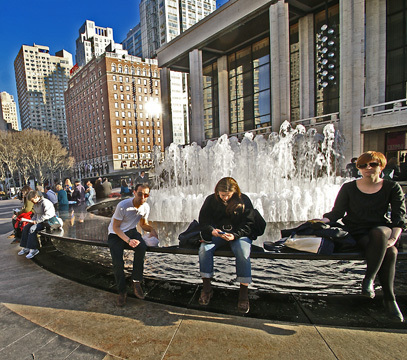 "At the heart of Lincoln Center is the iconic Josie Robertson Plaza, a rare open public space long considered by many as the main lobby for the entire campus, with the central Revson Fountain set into a distinctive patterned pavement designed by Philip Johnson originally inspired by the Campodiglio in Rome. The plans call for a full restoration of the patterned Plaza. In the spirit of making Lincoln Center a more welcoming, inviting destination, the new plans incorporate unobtrusive, state-of-the art security measures. "The revitalized Revson Fountain will give the appearance of a floating granite ring, opening views across the Plaza in all directions, and slightly lowered to provide comfortable seating to accommodate visitors. The pool of water also will be lowered and converted to a shallow water surface at Plaza level. "Lincoln Center Inc.'s Bravo Campaign leadership is headed by David Rubenstein; the working groups are led by Bruce Kovner (West 65th Street Project) and Dan Brodsky (The Promenade Project). Katherine Farley is Chairman of the Lincoln Center Development Project. "Separately, it will be announced that the firms of the California-based Morphosis and the New York City-based Tod Williams Billie Tsien Architects were selected as finalists to design the Harmony Atrium. Announced last week, the forward-looking agreement in principle with the Harmony Condo will transform the underutilized 6,900 square foot Harmony Atrium, a privately owned public space (POPS) located between Broadway and Columbus Avenues between West 62nd and West 63rd Streets, into a vibrant, 21st-century arts-oriented public gateway to Lincoln Center. The final selection will be made this summer, and work is expected to be completed by fall 2008. "Morphosis[:] Located in Santa Monica, California, the firm is noted for the stylistic diversity of its projects, which range in scale from academic and civic buildings to large-scale urban design master plans. Noted designs completed and in process include the Caltrans headquarters building in Los Angeles and a new academic building for Cooper Union in New York. The firm's principal, Thom Mayne, was awarded the 2005 Pritzker Prize. "Tod Williams Billie Tsien Architects[:] A New York City-based practice with a strong emphasis on innovative uses of materials, structural ingenuity and energy management. Recent projects include the American Folk Art Museum in New York City and the Master Plan for a 25-acre campus in Mumbai, India. "Additional information may be found at the Transforming Lincoln Center area of www.lincolncenter.org." The people mentioned in the press release above with the exception of Morphosis and Tod Williams Billie Tsien Architects and FXFowle have a lot of chutzpah and virtually no sense of architectural grace. These are the type of people who have made New York City a backwater of architecture for the past few decades, a trend that some observers thought was beginning to decline, but which, unfortunately, given the prominence of Lincoln Center, apparently is not. These are atrocious design decisions that might pass muster in suburban New Jersey but are indefensible and offensive in New York. The notion that New Yorkers are unable to negotiate crossing two lanes of traffic at the front of the raised platform on which the center sits is quaint since those poor culture-goers will already have managed to cross far more lanes of traffic on Columbus Avenue and Broadway and 65th Streets to get there. Why not, therefore, bridge over those car paths with something really elaborate and while doing it give the commission to some architects with flair. There is, of course, no need for such a mini-megastructure. In a June 12, 2006 article in The New York Times, Robin Pogrebin wrote that "Currently people heading to a Lincoln Center performance from the east side of Broadway must cross 11 lanes of traffic just to reach the sidewalk, then ascend a short staircase and traverse two lanes of cars dropping people off. Taxis must stop for crossing pedestrians, creating a line of cars and congestion at curtain time." She quoted Elizabeth Diller as maintaining that "To us this was really the evil protagonist of the project," adding that "Not only is there no gracious way to enter, but you're assaulted by traffic lanes and then bump into the Jersey barriers," or concrete security rails. The article stated that "About 40 percent of the traffic headed to performances comes from the existing roadway in front of the plaza, with 20 percent more at the Columbus Avenue curb and the rest at Lincoln Center's other access points. The new design aims to make drop-off and pickup traffic more evenly distributed." No gracious way to enter? Poppycock! The plaza is quite large and excellent for people watching and each of the main facilities fronting on it - the New York State Theater, Avery Fisher Hall and the Metropolitan Opera House - have ample, broad entrances and lobbies, and most importantly, second-story balconies overlooking the plaza. The one interesting feature of the "Promenade Project" is that each step of the redesigned front staircase will have, according to the article in The Times, "scrolling L.E.D. 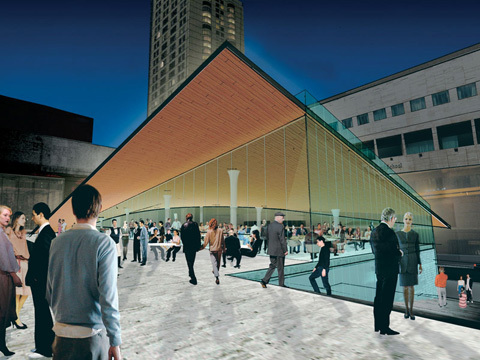 lights behind translucent glass will announce events at Lincoln Center." While such announcements may not have the panache or cachet of pithy Jenny Holzerish "quotations," or the wit of Barbara Kruger's great headlines, the notion at first seems not too bad, but then one begins to wonder about the legibility of such announcements in the short height of each stair, abut how well they will stand up to the pitter patter of New York feet, and how such signage will dignify and make more gracious the arrival of ticketholders. The Times article quoted Ms. Diller as describing the L.E.D. staircase as "a kind of electronic welcome mat, that gives you the general marquee information about what's playing." That will be so very very important to people arriving with their tickets for specific performances in hand, of course. An "electronic welcome mat" surely must have bedazzled the mighty patrons and directors of the center's illustrious components, but wouldn't it be cheaper and more fun just to have the Goodyear Blimp hover over the plaza with L.E.D. 's on its bulbous sides? Probably there are security reasons behind all this chicanery, but London liked to put up barrage blimps and since the Mayor doesn't seem to want to redirect airplanes from flying over Manhattan why not put up more blimps and stop messing with travertine steps. Ms. Diller was quoted elsewhere as stating that "We believe Lincoln Center deserves a dignified entrance like other major civic and cultural buildings of New York," adding that "It should have an extended threshold that transitions from the quotidian to the extraordinary." We would be happy to settle for the sublime, but it's nowhere to found in these new schemes. The New York State Theater is the best of the three main buildings fronting on the plaza and the Metropolitan Opera House is the worst. "One of the urbanistic problems of Lincoln Center is the campus is really divorced from the city, kind of a Acropolian structure - white - that sets itself off from the street," Ms. Diller was quoted, adding that "We wanted to make it transparent, make it float, open up as many surfaces as possible." Well, Ms. Diller travertine marble doesn't float and that is not a tragedy. She was also quoted to the effect that the plaza has some clutter - bars, garbage cans and security barriers. "It's kind of ad hoc blight," she was quoted as stating, adding that 'What we'd like to do is consolidate all the junk." Ms. Diller is obviously a very gracious lady, perhaps even neat. "As Lincoln Center greets summer by opening its spiffed-up new public spaces, including the swoopy new rooftop lawn above the still-unfinished restaurant and razzle-dazzle LEDs on the stairs, some gremlins appear to have turned the fountain in the center of the plaza into the high-culture version of an open fire hydrant. Four-story jets of water have lately been shooting up into oncoming gusts of wind, spraying the plaza and soaking unsuspecting visitors in the seconds before they can scatter. WET Design, which choreographed the dancing fountain, had promised a more sober, tasteful act than its magnum opus, the explosive aquatic chorus line at the Bellaggio in Las Vegas. Wind sensors are supposed to keep the burbling low on breezy days. But a Lincoln Center spokesperson said that the cultural complex has been testing new configurations, ramping up the fountain's acrobatics for benefits and other special events. It's nice to know, when an errant cannonball of water comes plummeting down on your shoulders, that at least the gala audiences watching from the balcony of Avery Fisher Hall are being profitably entertained." 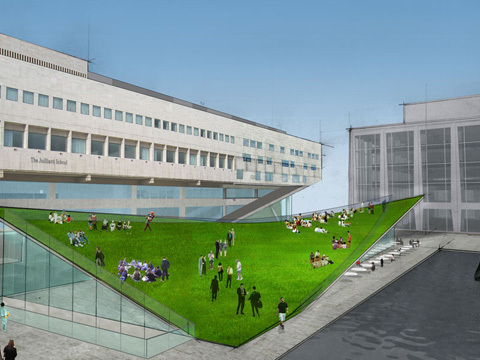 "The sloping grass roof on top of Lincoln Center’s anticipated new restaurant at 65th Street has closed after only being open for two weeks," according to an article by Avi June 3, 2010 at westsideindependent.com, adding that "It will stay closed 'until further notice,' according to a sign on a barricade in front of the lawn." "The beating sun and the sheer weight of all of the people using it apparently stomped the grass to death, a tipster told us. Indeed this morning we observed some big ugly brown patches on the lawn. A construction official said it was closed for 'maintenance' but wouldn’t elaborate," the article continued. The article noted that grass roof opened on May 21 with crowds of people piling on, and asked "Is this evidence of the success of the lawn, or an “epic fail,” as our tipster called it?" "'Richard Meier, Norman Foster ...' Charles Renfro paused, trying to remember the name of the third architect his firm, Diller Scofidio + Renfro, had beaten in a 2002 competition to rethink the 65th Street corridor of Lincoln Center. 'And someone else,' he finally said. "Well, the losers of an architectural competition are fairly unimportant, since to the victors go the spoils, in this case a lucrative project that - unusually for a big, contentious job - ended up growing in scope to encompass the rethinking of all of Lincoln Center's public spaces. "During a tour for some fellow architects sponsored by the Center for Architecture, Renfro and Smith spoke of the project's engineering difficulties—the unprecedented cementitious ceiling, the corner of the building where stone, glass, and cement all meet - and its massive scope. "Even with that scope, the project is essentially respectful, even conservative, matching Lincoln Center's desire to keep the shells of all the buildings intact. It was an expensive desire; the most drastic intervention - on the building housing Alice Tully Hall and the Juilliard School - reportedly cost $360 million, and Renfro said the sum was "probably double" what it would have taken simply to raze the original structure and build a new one. "But despite the expense - the result, Renfro said, of the difficulty of negotiating existing structural elements during the renovation - their proposal was likely selected, eight years ago, for its good-natured modesty. Smith said that Beverly Sills (then Lincoln Center's president) was almost shocked that Diller Scofidio + Renfro's plan accepted - liked, even! - the space it would be retooling, rather than criticizing it. "Even the new Alice Tully Hall/Juilliard shows love for Pietro Belluschi's 1969 building, showing an evolution from, not just a reaction to, its brutalist style. The renovation sliced off, at a sharp angle, much of the original building, replacing it with walls of glass and adding a vastly expanded lobby and studios for Juilliard overlooking Broadway. "The vocabulary that both architects kept using replaced Belluschi's muscularity with a more feminine warmth and transparency—'an architectural striptease,' as Renfro put it. "After looking at the building from a few outdoor angles, the group moved into the hall itself, which was also completely renovated. There was a newly installed organ. The old theater, another architect said, "focused mediocrely on every function that it had." The goal was to add more intimacy to the space, so the architects eliminated subway and air-conditioning noise, reduced clutter, and warmed the room by backlighting paper-thin wood veneer wall panels with LED lights. "A staircase, past an odd and unflattering portrait of a heavily braceleted Alice Tully with her dog at her feet, led up to the new patron lounge. In the old hall, the lounge was a cramped room in the back of the building. Now, it is a huge space with expansive views towards Lincoln Center's main campus. There is even a balcony overlooking the lobby, so that the nobility can watch the commoners arrive. "The leaking, she added proudly, had ended." 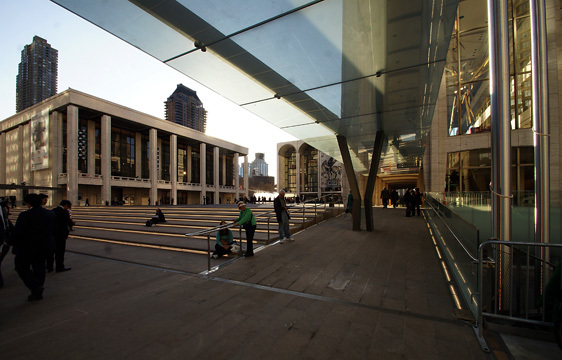 In a September 2, 2010 article in The New York Times by Robin Pogrebin entitled "At New Lincoln Center, Information Is Part of the Architecture," Elizabeth Diller maintained that her firm's efforts were "to turn Lincoln Center inside out, so that it would no longer be....'just something carved out of stone.'" "The monumentality of the scale of the buildings really needed to be softened up by a different, pedestrian scale," she said, adding that the Columbus Avenue stairs are "an electronic welcome mat" and that the thirteen, 24-hour, L.E.D. "blades" on the south side of 65th Street are meant to be "much more atmospheric and gestural and impressionistic" than mere posters. The article said that the various elements are part of "a wholesale reimaging of the complex as moreporous, inviting and immediate."